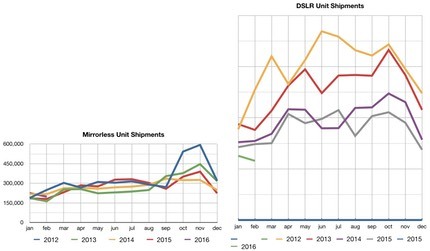 Mirrorless showed a slight blip upwards in 2016, DSLRs a slightly larger dip from 2015, but short periods like this are highly subject to variation due to new model introductions, and there weren’t really many significant shipments of new DSLR models in Jan/Feb this year. How’s that for a collapse of an industry? The peak in 2008 was 110m units. 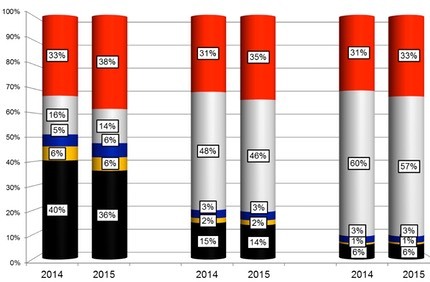 The 2016 forecast is something around 18m units. Okay, but that’s for all cameras, what about ILC cameras (mirrorless and DSLR)? The peak was a bit over 20m units in 2012, with the 2016 forecast now down to about 12.5m units. 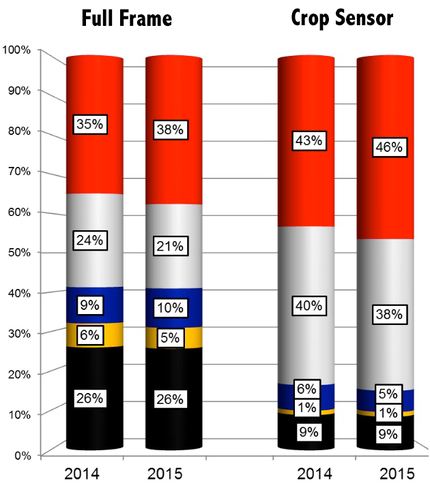 A side note: CIPA shipment figures for an upcoming year tend to be mostly self-fulfilling. That’s because plans for new products and production of them is already in progress by the time the forecast survey is taken. If actual retail sales lag the forecast, we tend to get oversupply in the retail channels. 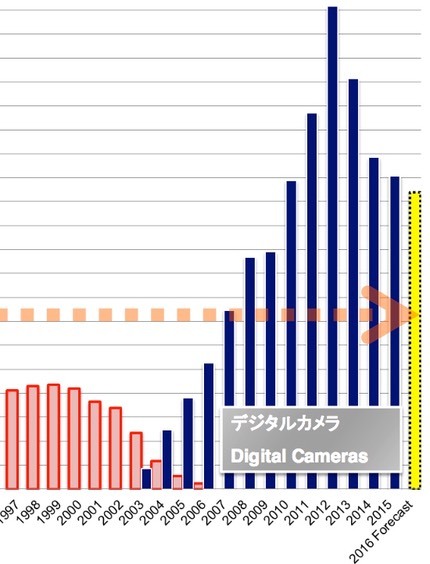 A lot of consumer cameras ship with “standard zooms”, and those are counted in this chart. 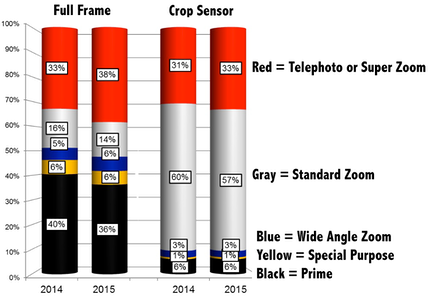 And most of those consumer cameras fall in the crop sensor group. In terms of Canon and Nikon, they don’t make many crop sensor special purpose or prime lenses, so they don’t sell many ;~). The mirrorless companies aren’t shipping enough of these type lenses to make up for the Canikon distortion. Note how the value of primes goes down for full frame while the value of primes for crop sensor goes up (despite the Canikon distortion). 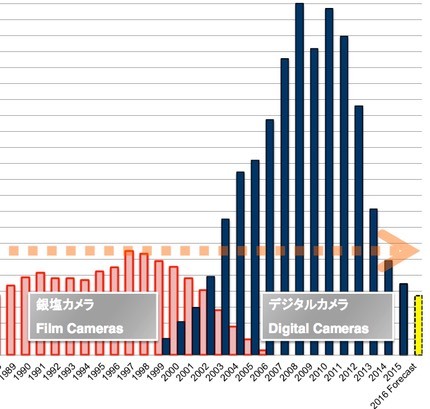 Overall, the number of lenses purchased per camera has moved in a narrow range for quite some time (currently about 1.68 lenses shipped per camera shipped). Japan and the Americas tend to be higher, Europe and Asia lower. For example, the number was 1.85 for the Americas in 2015. There are a lot more gems to found in the CIPA data, but I’ll leave those for you or others to find. My net take from both the year-ended and year-forecast-ahead numbers is that nothing is particularly changing other than maybe the ratio of DSLR to mirrorless. Compact and DSLR camera volumes are clearly still in decline, while mirrorless tends to be in a narrow range with a slight upswing. And while the average selling price has increased for pretty much everything over the past five years, that value is calculated in yen, so you have to look at how the currency exchange rate and regional volumes are distorting that. Bottom line is that the bottom line in the camera business ain’t so great. DSLR to mirrorless is now approaching—for the first two months of the year—2:1 (down from 3:1). If that trend continues through the year, I think it pretty clear that Canon and Nikon will try to move in and dominate mirrorless. They will have no choice in the matter. Note that these differ a bit from CIPA’s number (I’m at 12.3m units, CIPA says 12.5m). I think Canikon will have to shift more of their DSLR volume to mirrorless this year, and this won’t be a simple or smooth process.